The Rex is my favourite German cyclemotor. It has all the essential ingredients: antique looks, it’s a lightweight unit, is well made, has good spares availability, is easy to set up …and it chugs you along the road with a typically delightful gurgle. I’ve always been a sucker for engines mounted over the front wheel with tank on the handlebars, because they look so much like the original old turn-of-the-century pioneer motorcycles. Our 1950s cyclemotors are, in effect, just a postwar version of those earliest prototype motorcycles. There’s no clutch, and the front end takes a bit of getting used to as, although the Rex is a lightweight engine, it’s still a bit heavier than a normal bicycle. But that’s definitely part of the fun of early fifties cyclemotoring. If you’re interested in motoring history, cyclemotors have the advantage of two histories: that of the engine manufacturer, and the cycle company too. Most cycle-attachment engines such as the Rex were sold to fit to a cycle of your choice. In what other area of our hobby would you have such a unique opportunity to design your own combination of vintage bicycle and engine to power it? This particular example combines a first class engine with a top-of-the-range 1952 NSU Opel Gentleman’s bicycle. As this is an NSU-Opel, this machine actually has three manufacturers’ histories. I’ve included a brief history of Opel at the bottom of the page. The Rex has a cult following in Germany, where good running examples such as this on a matching period bike command high prices. What other 1940’s/ 1950’s cyclemotor has such good spares availability? In Great Britain in the 1950’s, the Rex was sold under license as the Cyclaid, a cycle-attachment engine that mounted over the rear wheel instead of the front. Compare the two in the photo below. Next to the engine number on a Rex identification plate is its year of manufacture an the cubic capacity. It’s not widely known in the UK that NSU made a cycle-attachment engine. It looks remarkably similar to the Rex! Although they didn’t manufacture ‘hilfsmotor’ engines after the War like many of their competitors, they were one of the first German companies to recognize the potential for one in the 1930s, and their 63cc front-mounted Motosulm engine was introduced in 1931. The most unusual version of the Motosulm was this delivery bicycle with a front-mounted engine (above). The NSU Delivery Cycle Model 101 had its front carrier raised higher to allow for the fitting of the Motosulm engine. However, once the front basket was loaded (capacity 75kg) the bicycle was impossible to steer! Only a few experimental models of this version were made. Bearing in mind NSU’s early experimentation with front-mounted cycle-attachment engines, a NSU bicycle is a very appropriate companion for a postwar Rex hilfsmotor. 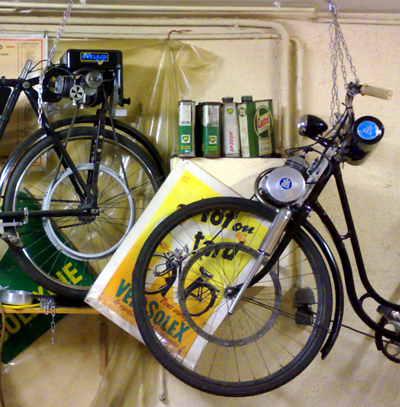 Opel started in 1862 as a sewing machine manufacturer, and went on to become one of the world’s largest bicycle makers. They sold the bicycle side of the business to NSU in 1937 to focus on car production. The following summary of the company is taken from Opel: Wheels to the World by Karl Ludvigsen (1975). Rüsselsheim. The history of Opel as a bicycle manufacturer begins at Christmas in 1885: Adam Opel gives each of his sons – Carl, Wilhelm, Heinrich, Friedrich and Ludwig – a velocipede. The company founder had become acquainted with the new invention the previous year during a business trip to Paris, where two-wheelers had already become a part of everyday life. After a test ride landed Adam Opel in a ditch, he decided to sell the obviously dangerous Christmas presents – at a considerable profit. The prices commanded convinced him that this new mode of transport represented an attractive business opportunity. As early as spring of 1886, the first high wheel bicycle left the factory, where sewing machines had been produced since the company was established in 1862. The designs came from England, the bicycle industry leader at the time. The first manufacturing facility dedicated solely to bicycle production is opened in 1888. In the same year, the protests lodged by other traffic participants against the increasingly frequent bicycle are rejected by Germany’s highest court, the Reichsgericht. The court ruled that when two vehicles meet – for example, a coach and a velocipede – each operator is responsible for his vehicle and must dismount if required. The ruling gave cyclists equal rights with carriage drivers and riders. The growing popularity of the bicycle, thanks to the less hazardous and easier-to-operate safety bicycle, was reflected in Opel’s sales and employment statistics. In 1889, Opel’s workforce in Rüsselsheim grew for the first time to more than 1000 people, who built 2200 high wheel and safety bicycles, while at same time continuing sewing machine production. Adam Opel had a cycling hall built in Rüsselsheim especially to allow new customers to practice, with his wife Sophie sometimes acting as an instructor. In addition, a cycling club was founded in Rüsselsheim, and a ladies bicycle was developed to serve the ever-growing market. Transport bicycles enjoyed increasing popularity among retailers and the postal service. The first crisis, however, came in 1898 when overproduction led to the demise of many small manufacturers. Even Opel’s production decreased from around 16,000 units to just 11,500 in 1900. After a major fire at the factory, Opel relinquished sewing machine production in 1911 and concentrated on bicycle manufacturing. In 1927 the company became the world’s largest bicycle producer, with 15,000 dealers selling bicycles made in Rüsselsheim. At the height of its production and following introduction of the assembly line in the mid-1920s, the Opel plant turned out one bicycle every seven seconds. Important innovations are introduced in production: balloon tires are adopted in 1930 for greater riding comfort and in 1933 Opel presents the torsionally stiff double-tube frame. “This principle is the most significant advancement in bicycle construction since the introduction of free-wheeling,” said Adam Opel AG to promote its new product. The frame is sold under the official name “Double Stable.” After 50 years of bicycle manufacturing, the last highlight came in 1936: Opel is named official supplier for courier services in the Olympic Village in Berlin. On February 15, 1937, Opel produced its last bicycle, a “Blue-Chrome” class bike with the serial number 2,621,964. The year the company celebrated its 75th anniversary, it sold its bicycle plant to NSU – where bikes were manufactured under the name Opel-NSU for one more year – in order to concentrate fully on automobile production.